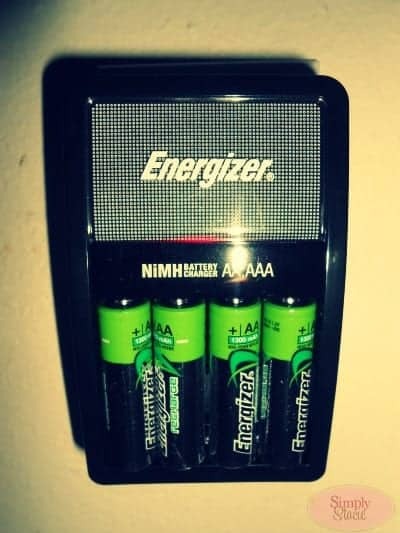 I love to use energizer because they last a long time! We’ve gotten battery chargers before but have never been able to get them to work… so we have a lot of rechargeable batteries but nothing to charge them with! My son has about 100 toys that take AA batteries… I should buy stock in battery companies. I use too many batties in my remotes! I would love to have a headlight! Because it could help us save money in the long run. I would also love to have the Power & Play Wireless Charging System for the Wii. I need one so I don’t have to share with the hubby! This would save so much money on batteries, but most important it is so much more environmentally friendly (less batteries in landfills). I have been wanting to get one of these especially when my grandchildren come over with their hand- held games and their batteries go dead. I am always needing batteries for the radios. I love how this would make us more environmentally friendly – we wouldn’t go through as many batteries! I would also love the Instant Charger Made for iPod and iPhone! This would be great, we go through a lot of batteries! I’d love this because we go through so many batteries it’s crazy! I’d love to be recharging instead of rebuying! I would use this for my camera! would love to have this to help us keep remotes, cameras and more charged and avoid buying and throwing out batteries all the time! we have the Power & Play® Wireless Charging System for Wii™ and love it! I always need batteries and am taking them out of other things. It seems that everything I own eats batteries like they are free. Comment on why you would love to use this Energizer® product in your home. We use batteries all the time so having rechargeble batteries would be great!! we use a lot of batteries and rechargeable batteries are the best. My little ones toys are always running out of batteries. Would love to win this to save on batteries. i need this because im always having to buy new batteries for the camera. My teenagers go through batteries like they go through mood swings! Any extra quiet time because of working games or electronics is golden. Id love to have the recharge plate. You can place your wii controllers on it and it recharges them. Wow…money saver! It would save me time and money from buying new batteries. I would charge my batteries for the Xbox 360 controllers, digital camera, and remote controls in the house.